TORONTO, Nov. 21, 2012 /CNW/ - The results are finally in! 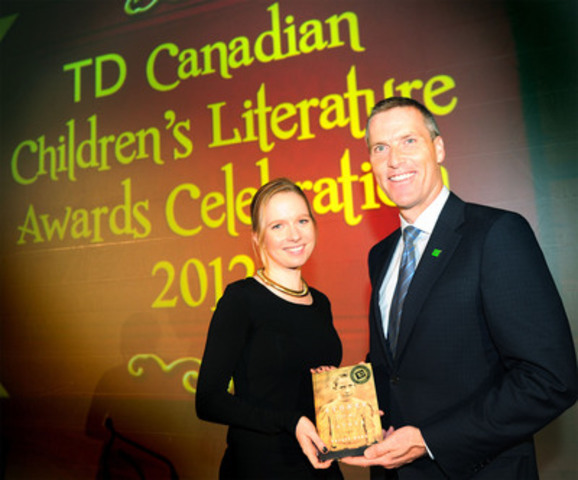 The TD Canadian Children's Literature Award was presented to local Toronto author. Trilby Kent received this year's top prize of $30,000 for her novel Stones for My Father (published by Tundra Books), which is the largest prize in Canadian children's literature. The eighth annual award ceremony took place in Toronto at the Ritz-Carlton Hotel and was hosted by TD Bank Group and the Canadian Children's Book Centre (CCBC). "Trilby Kent's powerful and thought-provoking novel is truly an award-worthy piece of literature. By describing the complexities of historical conflict in South Africa through the eyes of a child, she produces an emotionally engaging and inspiring story readers can relate to," said Tim Hockey, President and CEO, TD Canada Trust. "For TD, the importance of the TD Canadian Children's Literature Awards is more than curating Canada's best written work for young audiences, it's about promoting the advancement of children's literature, and encouraging children to continue reading, learning and exploring the wealth of what books have to offer." Kent's book, Stones for my Father, was selected from five finalists who represent some of Canada's leading children's literature authors. Stones for My Father is Kent's second novel for young readers. Addressing heavy historical subject matter throughout her award-winning book, Kent explores themes of racism, loss and human resilience during times of war through a well-crafted story for youth. "The Anglo-Boer War in South Africa is certainly not a subject covered today in most Canadian classrooms," said Trilby Kent. "But this devastating time in South Africa is historically quite significant and I wanted to write a story for young readers that would investigate the heavy subject matter through a lens my readers could identify with." The Dragon Turn, written by Shane Peacock (published by Tundra Books). No Ordinary Day, written by Deborah Ellis (published by Groundwood Books). Off to Class: Incredible and Unusual Schools Around the World, written by Susan Hughes (published by Owlkids Books Inc). Seal Song, written by Andrea Spalding and illustrated by Pascal Milelli (published by Orca Book Publishers). "We congratulate Trilby Kent for her outstanding contribution to children's literature, and for creating a story that will educate and inspire Canadian youth for years to come," said Charlotte Teeple, Executive Director, The Canadian Children's Book Centre. "And we would like to congratulate all the finalists as well as our winner at the awards in Montreal earlier this month - La saison des pluies written by Mario Brassard and illustrated by Suana Verelst." In addition to the TD Canadian Children's Literature Award, the event honours exceptional children's authors with the Marilyn Baillie Picture Book Award, the Norma Fleck Award for Canadian Children's Non-Fiction, the Geoffrey Bilson Award for Historical Fiction for Young People, the John Spray Mystery Award, and the Monica Hughes Award for Science Fiction and Fantasy. Trilby Kent was born in Toronto, and is a graduate of Oxford University and the London School of Economics. She is an accomplished academic who has worked as a rare books specialist, a freelance journalist, an academic editor and as a creative writing tutor with one of the United Kingdom's leading distance learning schools. Kent's strong background in investigative journalism and international development has influenced both her fiction and non-fiction work. In 2010, she was shortlisted for the Guardian's International Development Journalism Competition. TD Bank Group invests in communities to make a positive impact where it does business and where our customers, clients and employees live and work. In 2012, TD Bank Group donated over $65 million to support community organizations in Canada, the United States and the United Kingdom. In Canada, we focus on Education and Financial Literacy, Creating Opportunities for Young People, and the Environment. For more information, visit www.td.com/corporateresponsibility. The Canadian Children's Book Centre is a national, not-for-profit organization and registered charity founded in 1976 to promote, support and encourage the reading, writing and illustrating of Canadian books for children and teens. With book collections, programs and services and extensive resources in five cities across Canada, the CCBC is a treasure-trove for anyone interested in Canadian books for young readers. For more information, please visit www.bookcentre.ca.